Overcoming Objections Training Materials are designed to train your sales team how to nail the sales. Teach your managers and employees how to develop observation skills, how to handle objections, build credibility and more! Seeing is Believing This sample manual to teach Overcoming Objections to Nail the Sale is in MS Word format. Do you have participants who are having trouble dealing with objections in sales? Knowing how to handle sales objections effectively can turn a rejected sales proposal into a closed deal! Velsoft’s Overcoming Objections Training Materials teaches users how to turn objections around and use them to their advantage. Participants learn how to build their credibility as a salesperson to minimize objections; examine some of the most common sales objections; and learn sales comebacks and rebuttals to turn objections into another opportunity to showcase their product. Finishing with some of the best sales closing techniques, students finish the course prepared to deal with objections in the workplace. 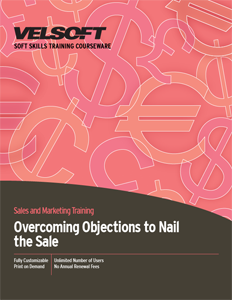 Velsoft’s training material on how to overcome objections to nail the sale has been designed with the trainer in mind. Including a self-study guide on how to overcome objections in sales, a customizable instructor’s guide and lessons plans, pre- and post-course assessments, and a quick reference guide, Velsoft’s training material can be used in combination with Velsoft’s eLearning website as part of a blended learning option. Students have the option of studying objection handling on their own, while instructors are given fully customizable training material to meet their classroom needs.